After the comparative rarity of an '18' BBFC card, viewers of Jonas Åkerlund's Lords Of Chaos are greeted with a methodically revealed line of stylistically scratched text. A proclamation, disclaimer and intimation all in one, it reads "Based on truth… lies… and what actually happened". No further clarification is given, the audience being trusted to distinguish these for itself. Inspired by Michael Moynihan and Didrik Søderlind's non-fiction book of the same name, Lords Of Chaos is a dramatised depiction of crimes carried out in Norway during the early 1990s. A string of grave desecrations, church burnings and eventually murders took place, carried out by young satanists obsessing over extreme heavy metal music, while the media looked on in panic and horror. The film follows Øystein Aarseth aka 'Euronyous' (played by Rory Culkin) as the founder and guitarist of black metal band Mayhem. Alongside Jørn 'Necrobutcher' Stubberud (Jonathan Barnwell) on bass, Jan Axel 'Hellhammer' Blomberg (Anthony De La Torre) on drums and vocalist Pelle 'Dead' Ohlin (Jack Kilmer), Aarseth does well, riding the cutting edge of the scene and making enough money to open his own specialist record shop, Helvete (or 'Hell')*1. As noted above, the film is based on historical and heavily documented events. This piece will nonetheless attempt to swerve around spoilers, but potential viewers would be wise to mind the BBFC guidelines. Scenes of extreme violence, self-harm and suicide are graphically depicted here with little-to-no restraint. Whether they're in good or bad taste almost becomes a moot point in a film which circles controversy like a vulture sizing up a dying animal. 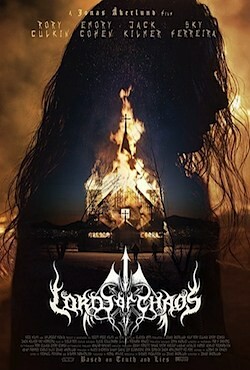 But there's no skirting around it, for all its intent to shock Lords Of Chaos is a massively uneven affair. Despite a niche setting in the most extreme of musical subcultures, Åkerlund's film often feels like it yearns to tell its story to a wider audience yet doesn't want to be accused of selling out in the process (a subject raised within the script itself as misanthropic musicians bemoan their lack of finances). 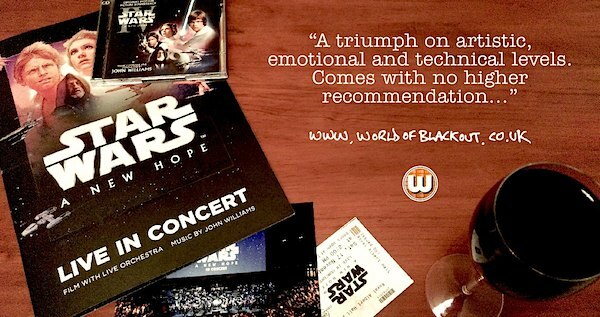 As black metal itself can hardly be toned down, there's the feeling that much of the music has been excised so that the film might appeal to a broader clientele. When the tunes*2 are engaged properly though, the film positively buzzes. A fantastic sequence in the first act shows Mayhem onstage. The erratic editing is a perfect translation of the sensory intensity experienced by fans of the genre, visually pitched for 'civilian' members of the audience who may otherwise have trouble otherwise picking meaning from the noise. Other than this and a later scene with Mayhem in the recording studio, the guitars, drums and mic-stands are little more than occasional props. The music becomes something which happens off-screen, literally the background noise to an escalating feud enacted through furrowed brows and sideways glances. Viewers coming for an in-depth soundtrack are likely to feel short changed. But in addition to the fury of the overall soundscape, a segment where Øystein has a vivid dream about a deceased contemporary is assembled like an intense and very well cut horror movie. If anything, it's a shame that this entirely fitting approach wasn't extended to the rest of the movie, as it would arguably be a much more interesting film in playing with disturbed characters' perceptions of reality. As it stands, what we get is a rather unremarkable telling of an alarming chain of events, skimming through several years in the life of Euronymous, the story told almost entirely from his viewpoint - certainly on a character-level. It's Aarseth's narration which welcomes and guides us through relationships that burn brightly and furiously. Yet while the audience are effectively on his side, screenwriters Jonas Åkerlund and Dennis Magnusson aren't afraid to present Øystein's shortcomings on both professional and personal fronts. Likewise with Varg Vikernes, who ultimately becomes our guide's bitter enemy, the only sense of sympathy or understanding evoked is a faintly mocking pity in his early scenes. Elsewhere, there are plenty of characters to dislike, and for a multitude of reasons. Referring back to the opening title-card, it's almost impossible to know how far the word 'truth' has been stretched here, of course. While the record of criminal activities stacks up alongside their victims, some of the characterisation shown in the film is markedly different to the testimonies of interviewees over the years. Veracity may be implied, but objectivity is notably absent. Naturally, everyone involved has their individual viewpoint and the film should be taken on its own merits. Back in the real world, an ethos of 'Team Varg' vs 'Team Euronymous' developed in the extreme metal scene over the years that followed. This film is unashamedly aligned with the latter. This isn't necessarily a bad thing, but seeing the story through Øystein's eyes doesn't seem to lend any unique insight into what happened (and it's certainly true that as Moynihan and Søderlind's book interviews many who were around at the time, that paints a broader and clearer picture). Instead we become observers trapped in a room full of antagonists. More crucially, while Åkerlund seems to delight in showing the 'how' of the crimes in question, the real 'why's feel almost entirely neglected. While the notion that the perpetrators were actual practicing satanists is ultimately brushed aside, more malign socio-political factors of fascism have since been shown to be at play*3. Yet while these aren't completely ignored, they're given similarly short shrift by the film. And with (often literally) incendiary actions like these, this feels like dereliction to the point of irresponsibility. Overall, the characters' flaws are painted so overtly that it's hard to say the film is lionising their viewpoints, but neither is it in any rush to condemn them. Little is seen of the mainstream reaction to the crimes, other than snippets of reconstructed news footage*4, and while an audience can obviously make up its own mind whether burning a church to the ground is a bad thing, the only judgement the film observes is some of the band's more 'sensible' contemporaries frowning and tutting. Although with social circles as tight-knit as these, that's quite possibly very accurate. 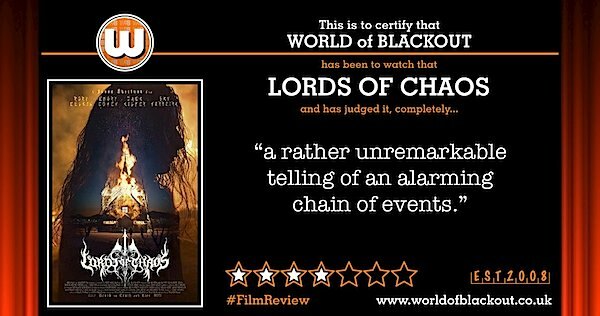 Ultimately it's unclear what Lords Of Chaos is trying to achieve and who it's really for. While the performances are accomplished enough, it appears that the characters themselves lack depth. Viewers arriving in search of insight or understanding at this late stage are likely to leave with largely the same baggage they brought in. Imagine the first hour and a half of Bohemian Rhapsody, but with more stabbing. If you're into extreme metal and it's showing near you, sure. Although you're probably better off that way yes, to be fair. Let's not go mad here. Level 2: Emory Cohen's in this, and he was in that Brooklyn along with Domhnall 'Hux' Gleeson.